1 of 5 In a large nonstick pot, heat oil over medium-high heat. Add onion and cook, stirring occasionally, for 5 minutes or until golden brown. Stir in curry powder and cook 1 minute. 2 of 5 In a small glass measuring cup, mix together 1/4 cup of the vegetable broth and the cornstarch. Set aside. 3 of 5 Into the onion-curry mixture, add the remaining 3/4 cup broth, 1 cup water, the tomato sauce, cauliflower, green pepper, carrots, chickpeas and salt. Stir to combine. 4 of 5 Into the onion-curry mixture, add the remaining 3/4 cup broth, 1 cup water, the tomato sauce, cauliflower, green pepper, carrots, chickpeas and salt. Stir to combine. 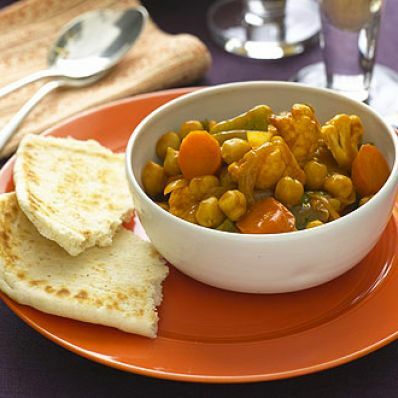 5 of 5 Spoon vegetable curry into bowls and serve with nan or pita; use the bread to soak up any juices. Per Serving: 2 g sat. fat, 358 kcal cal., 0 mg chol., 931 mg sodium, 12 g fiber, 8 g Fat, total, 59 g carb., 14 g pro.